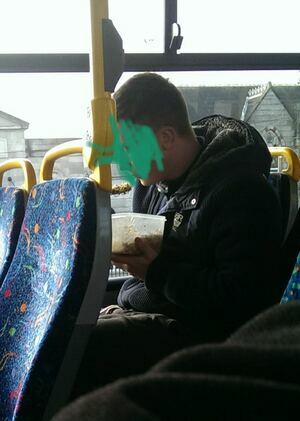 Posted in Misc and tagged bus surfing, Dublin Bus at 11:27 am on March 14, 2019 by Bodger. Ah… the 40c… I’d hazard a guess he’s not even the maddest hoor on that bus. He literally caught the bus. Was a kid (14-15) on the 83a yesterday who hopped in the middle doors to get on, rode for a couple of stops, then pulled the emergency exit button and got out in traffic on Georges St. I paid €3 to go from Glasnevin to O’Connell St. I see his point.